In sub-Saharan Africa, roughly two-thirds of Muslim adults (65%) have no formal schooling. The same is true for roughly four-in-ten Muslim adults in the Middle East-North Africa region (42%) and three-in-ten in Asia-Pacific region (32%). By comparison, nearly all Muslim adults living in North America and 95% of those in Europe have at least some formal education. In some European countries (Lithuania, Slovakia, Estonia, the Czech Republic, Hungary, the United Kingdom and Ireland), Muslims have about 12 years of schooling or more, on average. In others, Muslims tend to have less education, ranging from an average of 10.8 years of schooling in Georgia to a continentwide low of 5.8 years in Spain. In most of these countries, Muslims have less education than non-Muslims. The biggest gap is in Germany, where Muslims, on average, have 4.2 fewer years of schooling than non-Muslims (9.5 years vs. 13.7 years, respectively). Many of these countries have experienced large inflows of Muslim refugees or guest workers in recent decades. While the data in this report are from 2010, the surge of Muslim refugees to Europe in 2015 and 2016 from countries such as Syria, Iraq and Afghanistan may have increased the number of Muslims with fewer years of schooling than non-Muslims in several European countries. In countries with relatively high education levels among Muslims, such as the United Kingdom and Ireland, Muslim communities often have been shaped by immigration policies favorable to highly educated migrants. For example, Ireland’s economic boom of the late 1990s drew highly skilled Pakistani and African migrants and refugees. Partly as a result of this, Muslims in Ireland have an average of 11.8 years of schooling – one more year, on average, than non-Muslims in that country. In five of 19 European countries with available data on changes across generations, the Muslim educational disadvantage is larger among the youngest generation, compared with the oldest, partly because educational gains among Muslims have lagged behind those of non-Muslims. This is particularly apparent in Spain and Portugal. 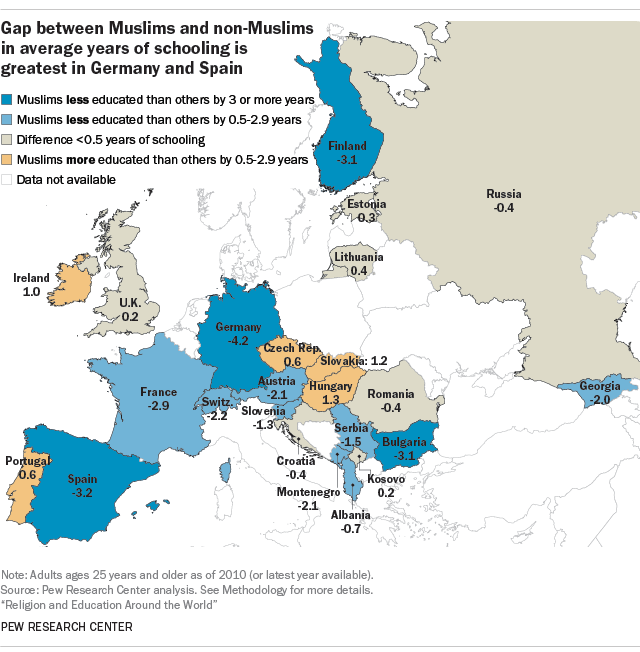 While Spain’s non-Muslim population gained roughly four years of schooling, on average, across recent generations, Muslims made virtually no overall gain across generations, which widened the gap between Muslims and non-Muslims from roughly one year among the oldest cohort to about a five-year difference among the youngest. Similarly, in Portugal, non-Muslims gained more than six years of formal education across cohorts, but Muslims gained roughly three years. By contrast, Muslims in Germany have made rapid progress over recent generations. Among the oldest generation of Germans in the study, Muslims lag behind non-Muslims by more than seven years of schooling, on average (5.9 years vs. 13.4 years). But while Germany’s non-Muslim population gained about one year of schooling across recent generations, Muslims gained more than six additional years. As a result, the gap between Muslims and non-Muslims in Germany among the youngest generation is only about two years of schooling, on average (12.5 years vs. 14.5 years). Muslim women around the world lag behind Muslim men in average years of schooling by a year and a half (4.9 years vs. 6.4 years). The gap is particularly large in the Middle East-North Africa region, where Muslim men have an average of 6.9 years of schooling and women have 4.9 years. These Muslim gender gaps are larger than the gaps for non-Muslims: Globally, non-Muslim men average 8.7 years of schooling, compared with 7.7 years for women, and in the Middle East-North Africa region, non-Muslim men have half a year of schooling more than non-Muslim women. 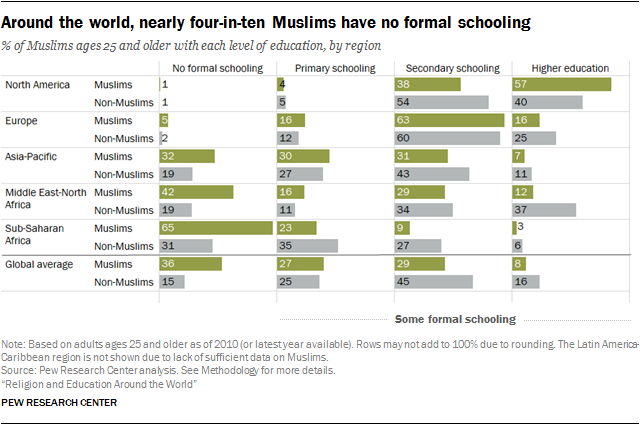 More than four-in-ten (43%) Muslim women worldwide have no formal schooling, compared with 30% of Muslim men. And in attainment of higher education, Muslim men lead women; 10% of Muslim men have post-secondary degrees, compared with 6% of Muslim women. From a generational perspective, Muslims have made substantial gains in educational attainment. Over the three generations in this study, they have gained an average of 3.1 more years of schooling: The youngest Muslims have, on average, 6.7 years of schooling, as compared with the oldest, who have 3.5 years of schooling. The largest gains in average years of schooling have been in the Middle East and North Africa. In that region, Muslims have gained 4.5 years of schooling across generations, from an average of 3.2 years among the oldest Muslims to 7.6 years among the youngest. Over the same time period, the share of Muslims with no formal schooling has decreased considerably, from 54% in the oldest generation of Muslims in the study to 28% in the youngest. Again, the largest decreases in the share of Muslims with no formal schooling were in the Middle East and North Africa, where 67% of the oldest Muslims lack any formal schooling, compared with 26% of the youngest. Nearly all Muslims in North America and Europe have at least some formal schooling.7 The share of Muslims in sub-Saharan Africa with no formal schooling dropped by 22 percentage points, but a majority of the youngest Muslims in that region (57%) still lack even a primary education. The share of Muslims with a post-secondary education has grown in recent generations, albeit more modestly, rising from 4% of the oldest Muslims in the study to 10% of the youngest. The largest increases occurred among Muslims in the Middle East-North Africa region (9 points), North America (8 points) and Europe (7 points). Muslims in sub-Saharan Africa, who make up 30% of the region’s population, have the largest share with no formal schooling (65%) among Muslims anywhere in the world. In addition, the gender gap in education among Muslims in sub-Saharan Africa has remained mostly unchanged across generations, and the share of all Muslims with no formal schooling in the region is higher than the share of Christians with no formal schooling. The gender gap among Muslims has held steady and even widened slightly on some measures of attainment. For instance, the gap in the share of Muslims with no formal schooling has continued across generations even as more women complete some formal schooling (see chart). Muslim men in the oldest generation in the study average about one more year of schooling than Muslim women, but in the youngest generation of Muslim adults ages 25 and older in sub-Saharan Africa, men average 1.7 more years of schooling than women. The gender gap in higher education also remains across generation, although very few Muslim men or women in the region have college degrees. This means that although the youngest Muslim women in sub-Saharan Africa are making educational gains, they are not making them at the same rate as their male peers. This pattern differs from other regions of the world, where Muslim women are generally making educational gains at a faster pace than Muslim men. In all other regions except North America, Muslim women have gained more years of education, on average, than Muslim men across the three generations in the study.8And in all regions but sub-Saharan Africa, the share of Muslim women with no formal schooling decreased sharply compared with the share of Muslim men with no formal schooling. Meanwhile, the educational disparities between Muslims and Christians in sub-Saharan Africa have grown in recent generations, largely because Muslims have not kept pace with educational gains made by Christians (who make up 63% of the region’s population). The oldest Muslims in the region have 2.4 fewer years of schooling, on average, than the oldest Christians. But among the youngest group, that gap has grown to 3.6 years. In addition, despite growth in the share of Muslims with some formal schooling, the Muslim-Christian gap by that measure also has expanded across generations. 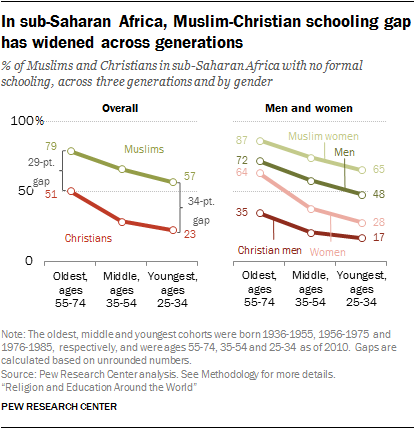 Among the oldest generation, 79% of Muslims and 51% of Christians in sub-Saharan Africa have no formal schooling – a 29-percentage-point difference. But among those in the youngest generation, the Muslim-Christian gap has grown to 36 points, with 57% of Muslims and 23% of Christians in the region lacking any formal education. The Muslim gender gap in the share with no formal schooling, which has widened across generations, also presents a contrast to the diminishing Christian gender gap by this measure. While the Muslim gap has grown by a few percentage points, the Christian gender gap has shrunk by 18 points (see chart). 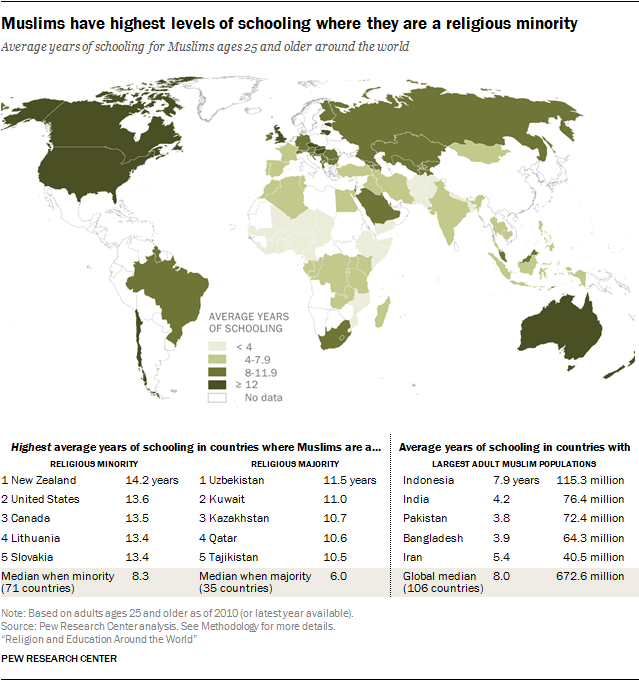 The Muslim-Christian education gap is seen within many individual countries in the region. In 18 out of 27 sub-Saharan African countries with substantial Muslim and Christian populations, Muslims are more likely than their Christian compatriots to have no formal schooling by at least 10 percentage points (see chart below).9 In Nigeria, for example, where Christians and Muslims each make up about half of the population, roughly six-in-ten Muslim adults (61%) have no formal schooling, compared with about a quarter of Christian adults (26%). 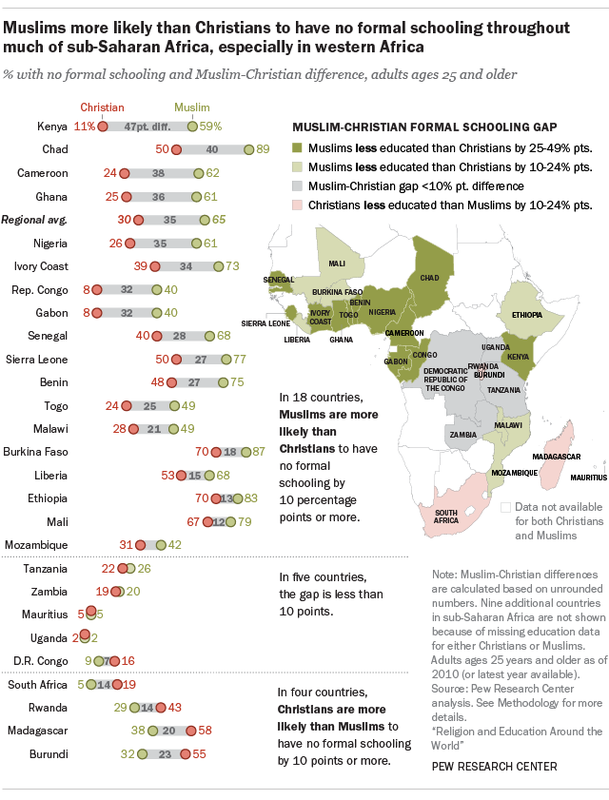 By contrast, in a handful of countries (South Africa, Rwanda, Madagascar and Burundi), Muslims are more likely than Christians to have at least some basic education. In all of these cases, however, Muslims are a small religious minority, making up 3% or less of the national population. For a discussion of the possible reasons behind Muslim-Christian attainment differences in sub-Saharan Africa, see Chapter 7. Globally, recent generations have seen a narrowing of the Muslim gender gap in educational attainment as women have made bigger gains than men by most measures of attainment. For example, Muslim women have had a larger increase in average years of schooling than men, going from 2.5 years of education among the oldest Muslim women, to 6.1 years among the youngest, a gain of 3.6 years. By contrast, Muslim men gained 2.7 years of schooling, on average, between the oldest and youngest generations included in this analysis. In the Asia-Pacific region – home to more Muslims than any other region – the gender gap in average years of schooling for Muslims has narrowed slightly among the youngest generation. Among those born between 1976 and 1985, Muslim men in the Asia-Pacific region have an average of 7.4 years of formal schooling, while Muslim women average 6.5 years. A similar pattern is found among Muslims in the Middle East and North Africa. In higher education, the gender gap among Muslims has narrowed by 3 percentage points over generations. Not only that, but in some countries, the gender gap has reversed among the youngest Muslims – meaning that young Muslim women are now more likely than young Muslim men to have post-secondary degrees. The gender gap in higher education has flipped in several Muslim-majority countries, including Algeria, Bahrain, Kuwait, Saudi Arabia, Tunisia, the Palestinian territories and Qatar (in the Middle East-North Africa region), as well as Iran, Indonesia and Malaysia (in the Asia-Pacific region). Indeed, in Qatar, the youngest women are more likely than the youngest men to have post-secondary degrees by 17 percentage points. The youngest Muslim women in the Gulf Cooperation Council nations have made such large strides in higher education across recent generations that they now are more likely than men to hold post-secondary degrees, according to data from Bahrain, Kuwait, Saudi Arabia and Qatar. About one-third of the youngest Gulf women (34%) have higher education, a rise of 30 percentage points from the 4% of women in the oldest generation who have post-secondary degrees. These gains far surpass those made by Muslim women elsewhere in the world, among whom the share with higher education has risen by just 7 points across three generations. Men’s gains in these Gulf states have not been as large. Roughly a quarter of the youngest men (27%) have post-secondary degrees, an 11-point increase over the oldest cohort. Among Muslim men elsewhere in the world, 11% in the youngest generation have higher education, a 4-point increase over the oldest group. Gains by men in the Gulf states also have not been as consistent across borders as those by women. While the youngest Saudi men are more likely than the oldest Saudi men to have post-secondary degrees (28% vs. 16%, respectively), gains are smaller among the youngest Bahraini men (11%), compared with the oldest group (9%).